Sorry... the 2017 Jeep Grand Cherokee is no longer being sold as new. Instead, take the first step to a great deal on 2019 Jeep Grand Cherokee with a free price quote! The 2017 Jeep Grand Cherokee is a full-size SUV that seats up to 5 passengers. It competes with the Chevrolet Traverse, Ford Expedition, and GMC Yukon. This year, it gains an off-road capable Trailhawk trim, while the Summit trim receives a revised exterior and interior. Six trims are available: the Laredo, Limited, Trailhawk, Overland, Summit, and SRT. The Grand Cherokee is distinguished by its 7-slot front grille, narrow-slit headlights, and rugged-looking fascia. Standard features include automatic headlights, front fog lights, and power/heated side mirrors. Available features include a trailer hitch receiver, skid plates, a dual-pipe exhaust system, turn signal indicators at the side mirrors, and a power liftgate. The new Trailhawk trim includes a unique decal for the front hood, an air suspension system, skid plates, off-road tires, red tow hooks, and special badging. The Summit trim has a revised fascia that looks sleeker and more elegant than the regular version. 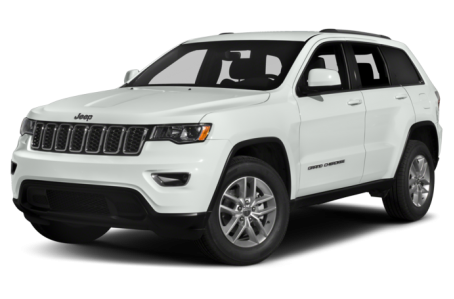 Under the hood, the Grand Cherokee is powered by a standard 295-hp, 3.6-liter V-6 engine mated to an 8-speed automatic transmission and front- (FWD) or four-wheel drive (4WD). The Grand Cherokee has a maximum towing capacity of 7,400 pounds when equipped with an available 360-hp, 5.7-liter V-8. The SRT models have a more powerful 475-hp, 6.4-liter V-8. Those needing better fuel economy may consider the optional 240-hp, diesel 3.0-liter V-6. Fuel economy for 3.6-liter models is EPA-estimated 19/26 mpg city/highway (18/25 mpg with 4WD). The Grand Cherokee has three 4WD systems available, including the Quadra-Drive II four-wheel drive system which has an electronic limited-slip differential. Inside, the Grand Cherokee has a premium leather-trim interior with a 60/40 split-folding rear seat. The instrument cluster has a configurable 7-inch screen. The center stack features a standard Uconnect multimedia system, which includes 5-inch touchscreen, CD/MP3 playback, Bluetooth connectivity for phone and audio, and a USB port. It can be upgraded to an 8.4-inch touchscreen, an integrated navigation system, and amplified audio speakers. Standard features include dual-zone automatic climate control, remote keyless entry, cargo tie down loops, and a leather-wrapped shift knob. A power tilt/telescoping steering wheel, a heated steering wheel, a dual-screen Blu-ray rear entertainment system, and a power moonroof are also available. The Trailhawk trim gets black leather/suede upholstered seats with red stitching and off-road expanded version of the multimedia system. The Summit trim comes with soft Laguna leather-trimmed, quilted seats. The 4WD Grand Cherokee earned a full 5-star overall crash test safety rating from the National Highway Traffic Safety Administration (NHTSA). Standard safety features include a backup camera, rear parking sensors, and a tire pressure monitoring system. A blindspot monitoring system, rear cross-traffic alert, lane departure warning, and an automated parking system are available as well. 158 of 161 (98%) consumers said they would recommend this vehicle to a friend.